Lows made frequent forays across the North Island during April, with Cyclone Cook a notable arrival on 13-14 April. The atmosphere was locked in a repeat pattern during April, with low pressure bee-lining towards Cape Reinga and producing intermittent heavy rain and high humidity across most of the North Island. More easterlies than usual were also seen over the South Island during the month. April rainfall ranged between 200% and 350% of normal over the entire North Island and the north and east of the South Island. Auckland recorded 439mm of rain during March and April, the highest since records began at the Airport in 1962. Tauranga saw 569mm (records since 1898), Hamilton observed 427mm (records began 1935), and Whakatane clocked up 482mm (records since 1974). Christchurch experienced 234mm during the two-month period (records since 1943), while Wellington recorded 360mm (observations since 1928). Looking ahead to May, change is in the wind. “The atmosphere is finally changing gear,” said Griffiths. “Expect a change away from constant lows on the weather map, towards high pressure frequenting the New Zealand region.” At this time of year, this equates to a recipe of high pressure sitting over the country for longer than usual, in between mobile westerly fronts. 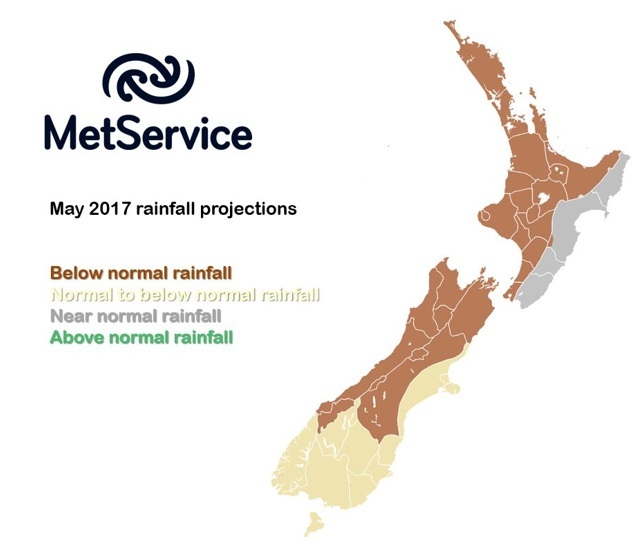 A drier-than-usual May is forecast for most of the country, except for Wairarapa, Hawke’s Bay and Gisborne (where closer to normal May totals are predicted). While May starts off colder than normal, temperatures are expected to bounce back, with a forecast of above-average temperatures across the country during the second half of the month. This entry was posted on	May 2, 2017 at 3:17 pm	and is filed under Press Release.